A wonderful and safer-than-expected port. I recommend your visiting. People are favorable about sailing boats. The island has a long history such as the story of fleeing Heike warriors. which gave me a sense of wonder and connections to God. 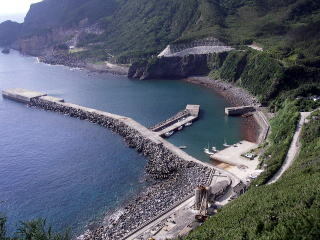 Yasura-hama port is the only one port in the island built under the cliff. 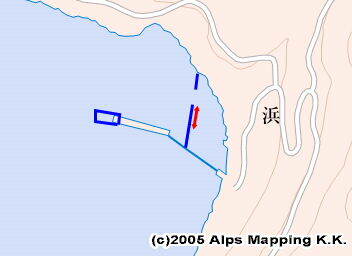 Approach: It is not easy to find out the port entrance. 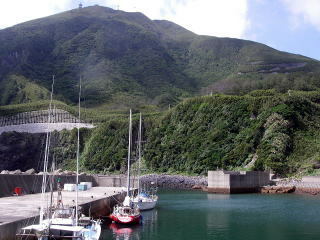 A big square form of the breakwater end can be seen from a long distance. Move into along the stretch of breakwater for the ferry. You can’t see the inner boat pool. At the end of the ferry breakwater, there is another breakwater running from south to north. move into and moor at the back of another breakwater. As the port space is small, your anchor rope could step in other boats ways. In addition, as I saw the sea bed is paved with concrete blocks, the anchor will not work. It was very calm in the port. I had thought that it was not good for the sail boat because it exposures to the ocean. But, local people in Naze and Takara-jima had told me the port was good. It was true. They said it was the calmest port other than typhoons. The ferry boat can moor here even when it can not moor at other islands. Toilet is at the first floor of the ferry station. Water is also available. 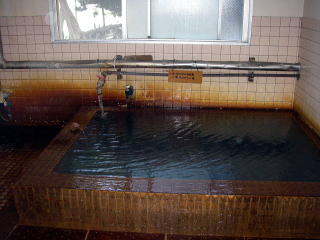 There is a wonderful hot spring with no charge 20 minutes walk away. No food shop. It takes half an hour to a small village through a cliff side path. The houses are scattered; not grouped together. between Yaku-shima and Amami-ohshima in Kagoshima Prefecture. Japanese web site of Toshima (ten islands in Japanese) Village introduces each island profile.